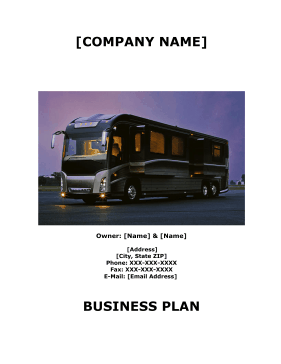 People who provide tent lodging and RV parks to travelers and campers can plan and organize their internal operations with this free, printable business plan. The long-term goal of [Company Name] is to provide temporary tent lodging and an RV Park by creating a differentiated experience capitalizing on personal service, the historical nature of the [CITY] buildings, and its unique location in one of the most attractive parts of the [STATE]. We plan to be more than a great lodging and RV Park. We plan to create an environment of pampered comfort and outdoor luxury that surpasses the standard fare. Expanding our exposure via the Internet and introducing the [CITY] area to people that have not yet discovered this year-round paradise will allow us to maintain a higher than average occupancy rate and above average profits. The [Company Name] is located in the [CITY] area of the [STATE] Panhandle. It is located just off [ADDRESS] at exit twenty-six. Our facility actually abuts the entrance ramp of [ADDRESS] east, it also only a few miles from maintenance supply outlets in Milton and [CITY], [STATE], including a Home Depot, Lowe's and a John Deere dealer. [CITY] is an established Tenting and RV Park, and has been in operation for the last 30 plus years under different management. After taking possession and a brief period of becoming established, we updated the facility and increased the number of sites to 49 to ensure a steady flow of patrons (tourists and locals) through its doors. The past owners had not been operating it to its fullest capacity and the site was run down. [Company Name] plans to use grant funding of $400,000, to hire 3 new employees and completely renovate the park grounds, roads and its major structures. This will include adding new roofs to the main lodge and the outdoor Pavilion, adding a new fishing Pond and making the bathrooms and showers handicap accusable. A new pole barn will be built to house equipment. Web services will provide national exposure to potential customers for nominal annual fees, and we already have a website [Website Address]. The RV park would like to see a 15% increase in customers on a yearly basis. • Increase exposure and market using Internet technology and direct advertising. • Through incentives and increased exposure on the Internet, we hope to increase off-season occupancy by 30% the first year. The mission of [Company Name] is to become the best choice in Santa Rosa County for temporary lodging by expanding our exposure via the Internet (with multiple networks and links), and introducing the area to market segments that have not yet discovered this year-round camper's dream. We plan to be more than a great RV Park. We plan to create an environment of conveniences that surpasses the standard fare. The RV Park guests will have every need met to ensure his/her comfort. We are going to cater to the handicap community through continuing to upgrade our facilities to be 100% accusable. As owners, we intend to see that attention to detail and service will be followed up by a staff dedicated to each guest. • Provide a facility that is first class with attention to detail. • Give each guest a sense that he or she is our top priority. • Retain our guests to ensure repeat bookings and referrals. The [Company Name] is located in the Milton and [CITY] area of the [STATE] panhandle. The company has been owned and operate by [Name] for the last eight and one half years. The park was originally established in the early 1970's. The original owner with his family managed the park until 1997. [Name] purchased the park in 2001 for $400,000 and made real and visible progress to reestablish the camper base. [Company Name] is a LLC, owned and operated by [Name] and assisted by [Name].